Hey guys! 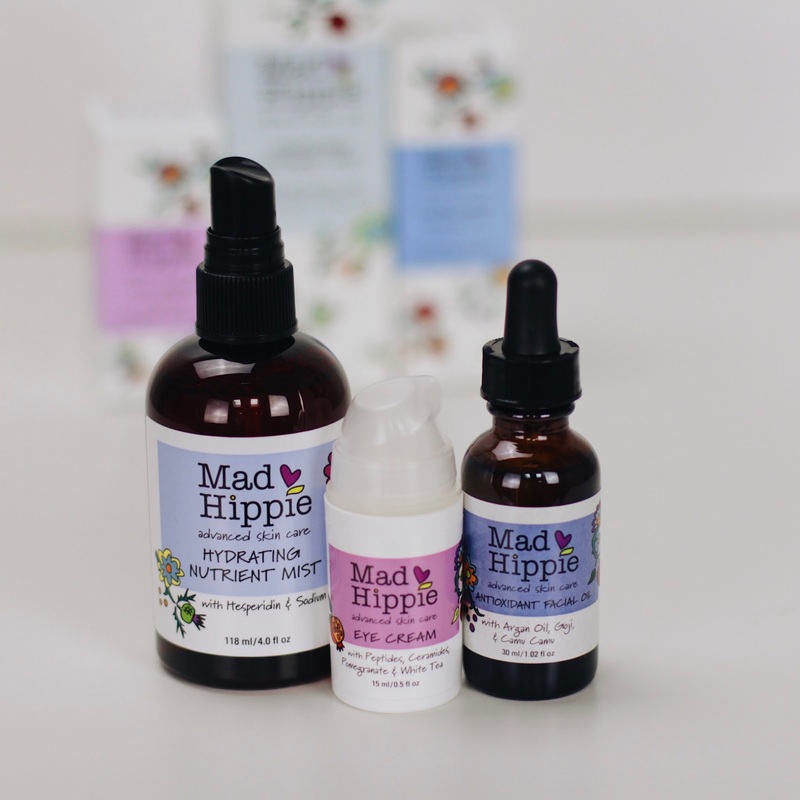 Today I will review a few products from Mad Hippie that I have been testing the past few weeks. I love being able to try a variety of products, especially natural skincare and especially local skin care products from here in Portland. All these products are vegan and cruelty-free. Mad Hippies product philosophy is creating formulations that safe, effective and contain no synthetics. 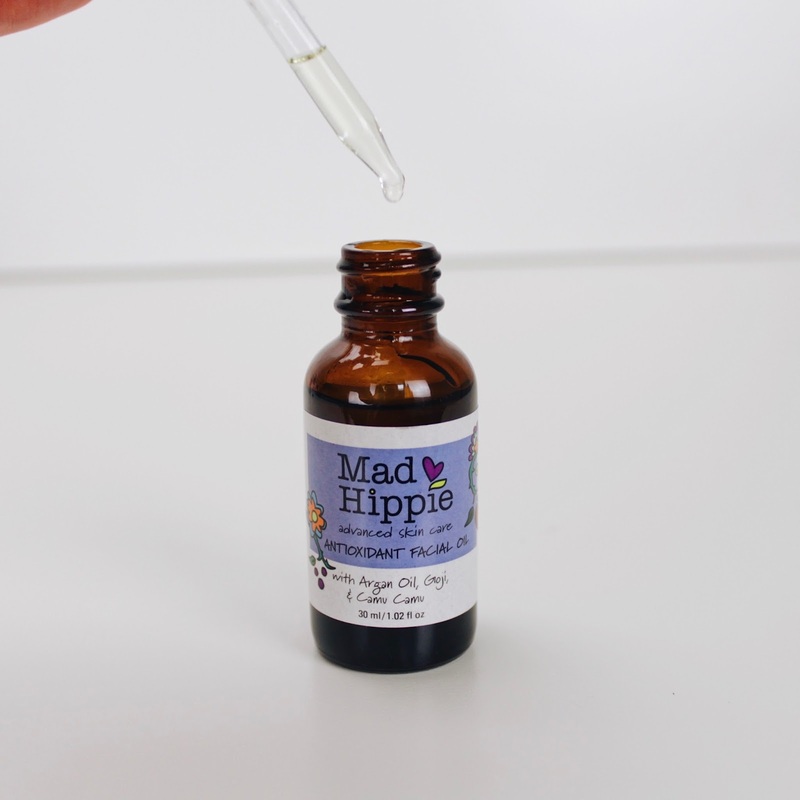 Instead of only having 1 or 2 main active ingredients, Mad Hippie using a multitude of different actives, formulated to all work together so you see results. This mist claims to minimize the appearance of photodamage using a blend of effective antioxidants plus provide hydration. This claims to protect against lines, wrinkles, puffiness and dark circles using the power of peptides and antioxidants. This claims to hydrate & protect the skin from photoaging. I always like to start my reviews by stating my skin type and conditions at the time of the review. If you follow me on Instagram, you will know that my skin can get sensitive and I am currently battling perioral dermatitis. I am also acne prone however, with the incorporation of treatments like Differin seen here, my skin seems to be less prone to breakouts but more easily dehydrated and flaky. My review will reflect how these products work for my personal skin type and condition and as a disclaimer, your results may vary. Every product I use goes through a very detailed patch testing period. I always patch test and I recommend patch testing to everyone. Although there is an argument out there that patch testing doesn't actually work seen here on The Beauty Brains, patch testing has saved my skin from some pretty serious negative reactions. Although I do agree with TBB (and love this podcast btw) that patch testing does not work against evaluating whether a certain product will cause breakouts, patch testing will help determine if your skin is allergic to the ingredients and/or the formulation. This type of negative reaction is seen in the form of itching, stinging, intense flushing, burning, rash or hives. First, I’ve been so obsessed with facial mist lately and the ingredients of this one are pretty amazing. This contains Hesperidin which fades discoloration & helps protect from photoaging. Sodium PCA is a humectant that increases hydration and helps bind moisture to the skin. Milk Thistle is rich in linoleum acid that will help to strengthen & protect. Resveratrol is a potent anti-aging antioxidant. White Pine Bark helps reduces redness and Pomegranate Extract which is high in ellagic acid that helps evens skin tone & corrects photodamage. Other ingredients include Vitamin C (brightens/evens out skin tone), Green Tea (a potent antioxidant), Hyaluronate (bind moisture), Ginkgo Biloba which is a great redness reducer. Ceramides protect, heal & locks in moisture. White Tea neutralizes free radicals. Syn-Eye & Regu-Eye are peptides to reduce lines & wrinkles. Matrixyl Synth 6 which is an advanced anti-aging peptide. Wheat Proteins help tighten skin. Vitamin B3 evens skin tone and Vitamin E works to neutralize aging free radicals. Sea Buckthorn Berry is one of my favorite ingredients because it does so much! It's rich in Vitamins A, B, C, D, K (lightens), P, carotenoids, amino acids & fatty acids. Organic Argan Oil contains essential fatty acids that help hydrate & help reduce scarring. Blueberry Extract is a superfruit rich in antioxidants that protects the skin from free radical damage. Goji Berry contains 18 vital amino acids, zinc, beta-carotene, and iron. Broccoli Extract reduces redness. Other ingredients include Pomegranate Oil, Camu Cumu Berry (high in Vitamin C), Strawberry Extract (protects), Raspberry Seed Extract (helps neutralize aging free radicals), Hemp Seed Extract (rich in omega fatty acids/moisturize and protect). Sunflower Seed Oil soothes and moisturizes. So I have a love/hate relationship with this mist. First, I love the ingredients yet the spray nozzle doesn't produce a fine mist. It sort of spits at you. I have tried to decant this into a better spray bottle and it works so much better. This does hydrate/moisturizes and has a brightening effect. I find that this does indeed reduce redness which is great since I am prone to redness, especially on my cheeks and chin. Any anti-aging effects would take longer, more consistent use but I do like this mist, however, it's not my favorite. It does have a funky, herbal scent that reminds me of erasers. Since the scent isn't my favorite, I spray a bunch in my palm and add in a few drops of the Facial Oil and it takes that eraser like scent away. I don't think I'd repurchase because of having to decant this into a better mist bottle and because of the scent. This is a very creamy yet lightweight eye cream that has a faint, naturally derived fruity scent that does dissipate. This feels very soothing and cooling around my eyes which I love because my eyes are quite sensitive and I suffer from chronic dry eye syndrome. Consequently, my eye area is always super dry and my under eyes look like crepe paper. I find that my skin just soaks this up like slurping soup lol! I have only been using this for a few weeks off and on, so yeah not constantly but when I do use it, my under eyes looks brighter, more even toned and moisturized. I also find that my dark circles are less pronounced and it tames my bags. I didn't realize just how well this works that I am now reaching for it both morning and night. My eye area is very sensitive and I haven't experienced any burning, stinging or any other negative reactions. I am crossing my fingers that after consistent use, this doesn't cause milia (I'm super prone to getting milia). As far as "anti-aging" effects, it would take more time (and consistent use) to see any true effects. However, this is a fabulous eye cream that won't break the bank! I would highly recommend! I think might be the thinnest, liquidy facial oil. It's so so thin that I end up getting it everywhere if I'm not careful. Aside from the thin consistency, this has a lovely, naturally derived (orange oil) fruity scent, soaks into the skin quickly and has more of a dry oil feel. You won't feel oily, just hydrated, smooth and soft. I also notice some brightening. The ingredients are phenomenal and for the price, this oil is a steal. This would be a great facial oil for all skin types, especially for those with oily skin, acne-prone skin and those wanting to naturally fade scarring. I am not sure if I'd repurchase just because of the very thin texture because it is a little messy.